Local NHS providers, clinical commissioning groups (CCGs), councils, and other health and care services have formed the Nottingham and Nottinghamshire STP footprint – one of 44 in England – to collectively plan how local services will work to improve the quality of care, their population’s health and manage finances across the system. STPs will drive a genuine and sustainable transformation in health and care outcomes over the next five years and help accelerate the implementation of the NHS Five Year Forward View locally. As well as strengthening local relationships through joint planning and working, STPs provide partner organisations with a shared understanding of the current challenges, a joint ambition and the steps needed to achieve the sustainability of local health and care services for the future. 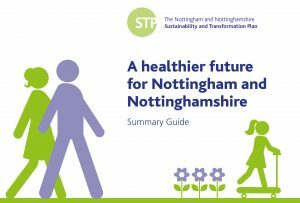 The STP for Nottingham and Nottinghamshire addresses how organisations will close the ‘three gaps’ identified in the NHS Five Year Forward View – the future vision for the NHS and social care – which relate to health and wellbeing, care and quality, and finance and efficiency. Ensure consistent and evidenced based pathways in planned care. In addition, key supporting areas of work have been highlighted within the plan as crucial to delivery, including; improve housing and environment, strengthen acute services, driving system efficiency and effectiveness, future proof workforce and organisational development and proactive communication and engagement. Councillor Alan Rhodes, Leader of Nottinghamshire County Council, said: “Our NHS is something to be proud of and we all need to work together to protect it. We are faced with big challenges if we want a service that will work for all of us well into the future. Doing nothing is not an option because rising demand for health and social care services is outstripping resources. The STP partners will continue to work together to develop and deliver these plans – ensuring that health and care services are planned and delivered around the local needs of communities rather than around individual organisations. Local people will see health and social care services increasingly working as one to improve care planning and patient and service user experiences of care. More services will move out of hospital and into community settings, closer to home, providing better access and value for public money. Improving social care, services for carers and access to primary and community urgent care will relieve pressure on the hospital, helping people to navigate the system and get the right care, first time with the support and information they need. Additional support and information will be available to encourage people to adopt healthier lifestyles, prevent disease and help people manage their own health better – improving quality of life and independence into old age. Information sharing and new technology will underpin many of the changes to how health and care services are delivered, from more professionals being able to access records and care plans through to personal devices used to monitor long-term health conditions. The STP published today is the draft plan submitted to NHS England on 21 October 2016. This plan will continue to be developed, it is not final is a reflection of local organisations’ current thinking about what needs to be done to improve health and wellbeing, the quality of care and local services, and address the financial challenge. As well as publishing the full plan, a summary of the key areas of focus has also been produced.